PowerPoint was used to create scrapbook pages. My Grade 6 students just completed their digital scrapbooks. They were made using Microsoft PowerPoint. I loved the activity so much that I am thinking about writing a TechnoKids technology project for the activity. Let me tell you more about it! It was the final computer class of the school year. We had just finished TechnoClue and I was interested in a quick review activity to fill the last class period. I knew whatever we did, had to be FUN! NOTE: The TechnoClue project has been a favorite for many years. Unfortunately, it is no longer available. To find other TechnoKids projects view the Project Matrix or visit the TechnoKids website. I had explored using Web 2.0 tools to create an online photo album but the school network prohibited using online apps. This resulted in my backup plan or PLAN B – to use PowerPoint. At first, I was so disappointed…that was until I experienced the students’ enthusiasm for the task. They LOVED it! To prepare for class, I had gathered photos taken throughout the school year and placed them into a shared folder. I had also created a sample digital scrapbook. When the students came into class I wasted no time. I introduced the task, showed the sample, and then offered design and layout suggestions. That was it! They were to use all the skills they had learned throughout the year to complete the task by the END OF CLASS. It was the perfect review activity. At first I wanted to use the Web 2.0 Tools such as Smilebox and MyScrapNook. Now I am glad I didn’t. Why? I now realize the power of a blank PowerPoint slide. It gives students an empty canvas that they can pour all of their creativity onto to transform it from something white and bland, to something colorful and interesting. A template from an online app can’t do that! The online apps I experimented with were very fun, but the design choices had already been made. This can be limiting. My students astounded me with their original ideas. For example, one students use a textured background that looked like a corkboard. She then applied a picture style to each picture to make it look like a Polaroid picture. Each image was stuck to the board using a clip art push pin. It looked fantastic! Another student used an AutoShape to list all of her classmates beside a class photo. She could not have done that with a preset template. I can go on and on about students amazing design and layout choices. I was really impressed by their skillset and the quality of the final product. Sometimes Plan B turns out to be way better than Plan A. Making scrapbook pages using PowerPoint was a fun activity and it would definitely be one I would do again. Presentation software offers a motivating and comprehensive way for students to demonstrate their learning by creating a slideshow. A slideshow presentation is a formal display of information organized onto slides to show or explain a concept to an audience. Students apply technology skills to arrange text, pictures, diagrams, graphs, sound, and video onto slides. Animations and transitions can be included to add interest to the show. A presentation can act as a visual aid during a lecture or speech. In Microsoft PowerPoint, the presentation file can also be viewed as a kiosk, video, web page, or handout. Students can learn presentation skills by completing a variety of projects. When selecting a product you want students to create using a presentation program it is essential to determine the technology skills that are required. In addition, you must consider the students’ grade level and previous computer experience prior to selecting a task. 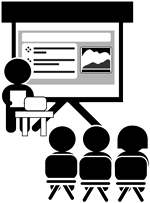 Presentation skills can be grouped into basic and advanced levels of difficulty. Integrate presentation technology skills into curriculum to create meaningful learning experiences for your students. Presentations are a creative and relevant way to hook students’ interest as they demonstrate their knowledge using multimedia.